I'm not sure if there's anyone who actually reads my blog regularly, but if you've read any of it before, you might be aware that I'm a fan of Pixie Lott. I actually really don't like the majority of female singers' voices (although I'm not even sure why), but Pixie's is just something else. It's very distinct, and I always recognise it, even if there's just a song playing very softly in a shop. I have been waiting in anticipation of Pixie's third album for a very, very long time. I can remember back when Turn It Up and Young Foolish Happy both came out and I'm so, so glad that the third album has finally been released. 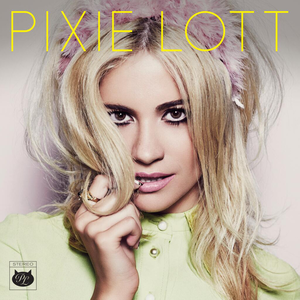 This album is self-titled, which is usually something artists only do for their first albums, but Pixie has stated that she thinks that this album gives the best representation of her, and thus it makes perfect sense why she would use her name for the album. I was actually really nervous to listen to the album, simply because I've been longing to hear it for so long and I wasn't really sure what to expect overall. But I'm honestly in love with it. There are a few real stand out tracks for me that I knew would be my favourites after listening to the track previews on iTunes. This is literally so much more than I had hoped for, and I just feel that this album is literally Pixie in musical form. There are a lot of motown influences and I love how she's mixed her prominent pop sound, that's been her niche for over five years, with the music that she's loved her whole life. This album is something really special in my eyes and I hope that other people will enjoy it too. The album opens with its leading single, Nasty, which was released back in March. I did a blog post on the single (here) and another blog post on the single signing (here) which I was lucky enough to attend. I still really love this song and it always picks me up and puts me in a good mood. It's just fun. Lay Me Down was the second single from the album, released just over a week ago. The video for this song is so timeless, with real 60s influences, including Brigitte Bardot and the likes. It was shot in the gorgeous sun in the south of France. The song is really catchy and I find myself singing/humming it all the time. I really love the acoustic session Pixie did for this song too, which you can watch here. It highlights her flawless vocals and makes the song sound even more relaxing. Definitely a great summer song. I really like the instrumentation in Break Up Song. It has a very distinct motown sound, something that features a lot on this album. It's very relaxed despite what the lyrics convey and I think that's why it works so well. It's essentially saying, we're breaking up, but let's just get out everything we've never said but always wanted to. It's like the idea of reliving the beginning of a relationship at the end of it??? If that makes sense. I just think it sounds pretty. This song is about winning someone over, perhaps when seemingly in competition with someone else. I really love the little bit of commentary in the middle, it makes it seem quite sports orientated, like the person who they're fighting for is the prize, like a cup at the end of a football match or whatever. The drums at the beginning feel like someone's warming up to start a match. I don't know, I can just hear loads of sporting influences in this song and I really like it, like the element of competition in sports is being put into love. It's different, and I really like it. The opening of Kill a Man is so YES. The organ and then it just jumps into the song with the drums. It's. So. Good. It's quite a sassy song, like, no boy gon mess with me. It's essentially asserting female power over a man and I think that's pretty darn important in modern day society. It's showing that maybe men are physically stronger, but a woman can kill you with her words and her actions without any kind of violence. You can really hear the 60s influences in this song as well, and that's actually the time that the feminist movement got serious, so I think this song would've been really fitting during that era, but still encompasses everything that happened back then and it's essentially still happening now. Probably not the intention of the song, but I feel that lolz. Ain't Got You was an immediate favourite of mine after first listening to the album previews and I really do love it. It's a really pretty ballad, with a very regretful and nostalgic tone. I've listened to this song so many times already. I like that it shows that women can hurt men's feelings as well, and they're not made of steel like they often attempt to convey: 'when I look into your eyes, all I see now are the tears that you cry.' The lyrics describe the regret from pushing someone away and hurting their feelings, which ultimately caused the relationship to end, and now the person is wanting to take it all back. The instrumentation really reminds me of another song but I can't put my finger on what song that actually is. I love this one. Heart Cry was released on youtube in December last year as a little something to get everyone more excited for the album and it did exactly that. Pixie shot the video in Paris and it's flawless, introducing the new sound in the perfect location. The lyrics are great, and really different from any I can think of that I've heard before and that's always rather refreshing. I like this song a lot and it reminds me of the real beginning of the album hype. I love the lyrics of Ocean and it feels like the song is a ride on a boat across the ocean, like I can feel the waves going up and down as the song progresses (maybe that's just me I don't know). It kind of expresses how emotions can feel like an ocean, like some sort of never ending abyss that you've created by yourself and can't get out of. I really like the acoustic version that Pixie did of this song with just her and an acoustic guitar; I think it really brings out the meaning and evokes relevant emotions even more. I think Raise Up is probably my favourite song on the album, because it's not about love or heartbreak, but about something I personally find far more difficult: self-belief. The song focuses on constantly trying to overcome obstacles, whether they're in the form of another person or something you think you can't do; it's about not giving up hope. 'The more that you stop me the faster I run, it's never that easy but I know I'll overcome.' I really get this: if someone tells me straight up, 'you can't do this,' I'll try all I can to do it. 'When I fall from grace, when I'm feeling out of place: I raise up,' is my favourite line, probably on the whole album, in particular the 'feeling out of place' part, because it's something I feel a lot and have to try and deal with. This is just the song that I personally connect with the most and I think the message is really important. And it's a ballad and just beautiful. I'm really thankful for this song. I really love all of the drumming on this album but I love it in this song most. Obviously, with the song being titled bang it's really emphasising the onomatopoeia what with the constant banging of the drums, especially when the word 'bang' is sung. I think this song would've been a great one to end the album on, with the lyric 'at least we can we went out with a bang,' or maybe that's kind of lame. I don't know. This is just a fun, upbeat song and I wanna sing it at the top of my lungs and annoy my neighbours haha. The piano in this ballad is really pretty, as are the backing vocals, and, of course, Pixie's own beautiful vocals. This song is very reminiscent, remembering all of the good times in a relationship that ultimately has to end. It's essentially about not wanting to leave someone but knowing it's the best thing for both of you given your circumstances. There's a glimmer of hope for the future, which adds a little bit more emotional stability to the lyrics. It's just so pretty gaaaaaa. Cry and Smile is a stunning song with so much meaning. Pixie wrote this song after the passing of her grandmother, and the song expresses her feelings given this event. It's so heartfelt and you can hear so many emotions in her voice. This is probably the most special song on the album, just because it's so personal to Pixie. 'I guess all good things must end' makes it seem like the right song to end the album with. It's really beautiful, and I love the middle eight, where the tone of the song changes slightly, lifting it up a bit more, then belting out the final chorus. I am so, so happy with this album. I think it's been worth the wait of about two and a half years, and I really like the direction Pixie's music is going in, with her getting the blend of old and new just right. The motown influences mixed with Pixie's modern pop sound is so easy on the ears and works even better than I could have hoped. Would highly recommend checking out this album, as it's got that something special that pushes it out from all the other music circulating at the moment.